Black Pepper Prawns/Shrimp Recipe. Famous and mouth watering dish that will swallow all the way to your ears! Easy Prawns recipe. Mix all the marination ingredients in a bowl, add in the prawns and allow to marinate for at least 30 minutes. Heat oil in a wok over high heat. Add in all bell peppers and cubed onions (deep fry these items for only about 8 – 10 seconds! – make sure the oil is hot enough) and bring out all the fried items from the wok to drain the oil. 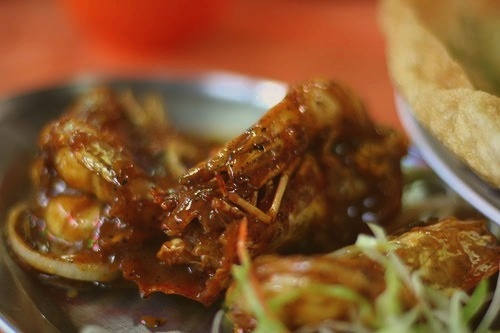 When the prawns are cooked and floated, take it out and drain the oil. Heat butter in a wok over medium heat, add in chopped onions and curry leaves; saute until fragrant. Add ginger-garlic paste, saute, add in dark sauce, oyster sauce, coriander powder and stir fry until oil leaves the sides. Add the stock (or water), stir, add lemon juice, salt to taste, sugar and stir until the moisture has evaporated. Add in fried bell pepper, fried cubed onions and coriander leaves. Flip the items in the wok again! Cook for a minute. Sprinkle spring onions and serve hot with plain white rice.